US Marines using Ashbury’s VECTOR 21/CLRF and VECTOR/DAGER with remote firing switch. At one time surveillance meant knowing the enemy’s location, number of troops, and artillery, but this has all changed with emergence of terrorism. Today’s, soldiers are conducting “persistent surveillance,” which is essential to defeating today’s unconventional enemies. Based on watching enemies 24x7, decisions must be made and communicated to the striking force within seconds or opportunities are lost. In an increasing number of cases, Unmanned Aerial Vehicles (UAVs) are used for persistent surveillance. 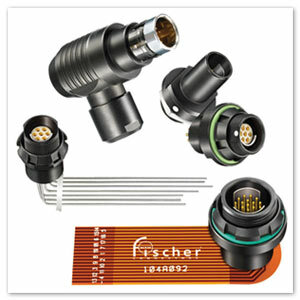 This type of life-saving, intelligent technology is made possible by a variety of companies including Fisher Connectors. This Swiss-based company provides highly reliable connectors for UAVs and other types of military equipment like the surveillance and weapon systems created by Ashbury International. Together these two innovative partners are providing soldiers with military surveillance equipment and weapon systems that stand apart from the competition. Founded in 1995, Ashbury International Group is committed to providing state-of-the-art technical and equipment support for the US army and allied nations. 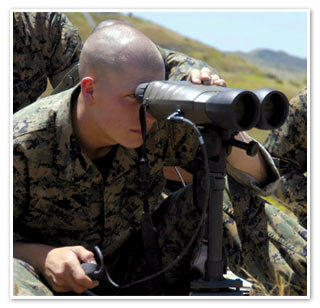 As a prime contractor for the Department of Defense for laser range finders, combat equipment integration, night vision devices and other electro-optic (E/O) devices, Ashbury works diligently and proactively to deliver innovative products and services for emergency preparedness, security, government, defense and SOF communities. Ashbury’s multi-disciplined organization provides equipment engineering and design, rapid product development, small arms manufacturing, operational training, systems integration, emergency preparedness systems and technical security services to its broad customer base. A prime example of Ashbury’s innovative products is the integration of the Vectronix VECTOR 21 for military ground target location applications. This includes the VECTOR 21 binocular laser range finder, which digitally communicates with military PPS-GPS navigation sets and a wide range of battlefield computing devices to precisely locate distant targets. The VECTOR 21 is an enhanced version of the VIPER binocular laser range finder, which saw significant use by coalition forces in Operation Enduring Freedom (Afghanistan) and most recently by Special Operations Forces, U.S. Marines and the U.S. Army during Operation Iraqi Freedom. Wide range of body styles and sizes. Always in pursuit of the soldiers’ safety, Ashbury created the STORM, which allows a sniper to engage targets at extended ranges while staying behind the rifle with no spotter needed. And, its latest product the SABER®FORSST® rifle chassis transforms traditional sniper rifles by making them shorter, lighter, and easy to carry in a soldier’s rucksack so as not to be evident to the enemy. This is a major factor when it comes to observation and surveillance and it requires companies partnering to improve soldier’s safety. “Throughout the course of designing and creating systems for the Future Soldier Programs, Fischer Connectors has been a key innovation partner. So much of the equipment we work with must be integrated with a variety of battlefield platforms, either with or without an observation system. Our battery technology sub-systems help us increase situational awareness for our soldiers who are counting on critical satellite to sensor connections to engage hostile threats,” continues Vance. “Additionally, combat in the Middle East, such as Afghanistan and Iraq, has presented some extreme conditions. Materials must be carefully chosen to be corrosion resistant. Our products must be strong, vibration resistance, sealed, lightweight, easy to disconnect and connect, and able to withstand the rigors of an over-packed 80 pound plus rucksack common among today’s warfighters. Making our equipment rugged enough is our goal and working with partners whose product can stand up to our demands is essential. Our materials cannot fail, because we cannot fail our soldiers,” explained Vance. The Fischer LandForceTM Series has a secure push-pull system, and the new body style is very compact and rugged. Thanks to its new one-piece plug body design with high performing epoxy potting, Fischer has achieved a new industry benchmark. Fischer LandForceTM Series is Nuclear, Biological, Chemical, Radiological (NBCR) ready, with IP68/69K sealing level even unmated and tested according to IEC norm 60529. It is immune to even the toughest elements including fog, salt spray, sand, and moisture. Its long lifetime usage is guaranteed for 10,000 mating cycles and easy cleaning on the field is possible. 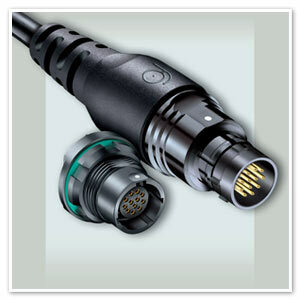 It’s available with Fischer complete and easy cable assembly solutions in both straight and right angle overmolding.